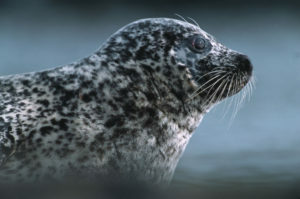 The UK hosts very high numbers of seals and is crucial for their conservation. In fact the UK is home to around half of the total world population of Grey Seals (Halichoerus grypus), with the UK population having doubled in the last 50 years! However, Grey Seals pups are born towards the end of the year and it is in fact our other resident species, the Common Seals (Phoca vitulina) that are currently having their pups and spending more time on land so it is a good time to see them with their rather cute pups! Their name, with respect to the UK, is somewhat of a misnomer, whilst the population around our shores is approximately 40,000 they are in fact far less common than Grey Seals whose numbers are around 120,000. In world wide terms however, the name is correct, with world populations of Common Seals estimated to be around 500,000 against the Grey Seal’s estimation of less than 250,000. The two species are relatively easy to tell apart, not by colour as the names can perhaps suggest, but by their face shapes. 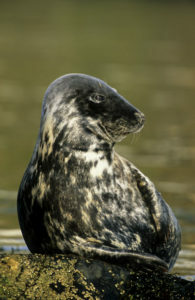 Common Seals have much rounder faces, with shorter muzzles than the larger Grey Seal – arguably as adults they are perhaps the ‘cuter’ of the two. The photos below illustrate the face shapes. Common Seals, whilst smaller than Grey Seals are still large marine mammals, with bulls being up to 1.9m and females up to 1.7m including their flippers. They vary somewhat in colour but tend to have spotted grey/brown fur. Their diet consists mainly of a wide variety of fish including herring. sand eels, whiting and salmon, they are also partial to shrimps and squid. Whilst their hunting and feeding habits are not well understood but it is known that they can travel relatively large distances from their haul out spots to feed, often 40-50 km, though aside from these extended hunts tend to stay much closer to the shore, including many estuaries, giving rise to their other name of Harbour Seal. As perhaps expected they are superbly graceful and agile in the water and can dive to depths of around 50m in their hunt for prey, often staying underwater for 10 minutes. Common Seals do spend a relatively large amount of time out of the water on rocky shores and sand banks where they rest, give birth (unlike whales and dolphins), suckle their pups and moult. Courtship and mating take place underwater and lead to the birth of a single pup. Pups are very well advanced by the time they are born, weighing between 8-16kg at birth, and within a few short hours they are able to swim and dive. They are fed an extremely rich milk by their mothers and grow very rapidly, doubling their weight within the suckling period of around 4 weeks. After this period the cycle is ready to begin anew and the female is ready to mate once more. Common Seals moult in August and September. The males play no part in rearing the pups, instead contesting with one another to increase further breeding opportunities. There are numerous places to see these beautiful mammals around the country, including Blakeney in Norfolk (and more generally the North Norfolk coast), and a variety of locations in Scotland such as the Moray Firth, the Firth of Tay, the Orkney and Shetland Isles and some of the Hebridean Islands. At some of the Scottish Locations you may also see some of our other stunning ocean life such as dolphins, porpoises and even whales! If you are able to travel to any of these locations then you are very likely to be rewarded with great views of the seals and their pups, and if fortune favours maybe something else as well!